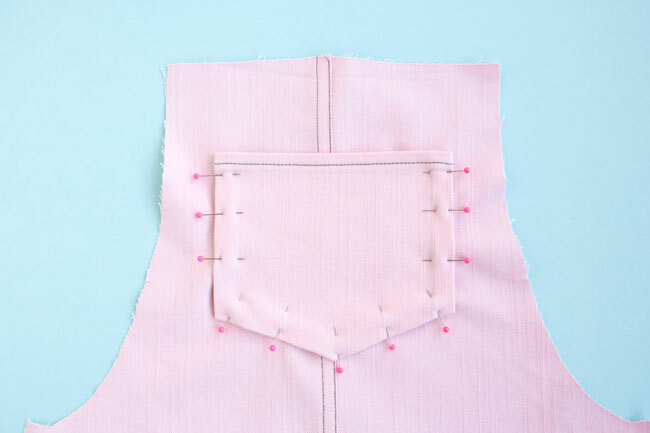 If your fabric is fairly bulky - such as a heavy denim or corduroy - your presser foot might need a little help getting started topstitching the pockets to the dress. Try making a "stitch starter". Position the pocket under the presser foot ready to start sewing it in place. 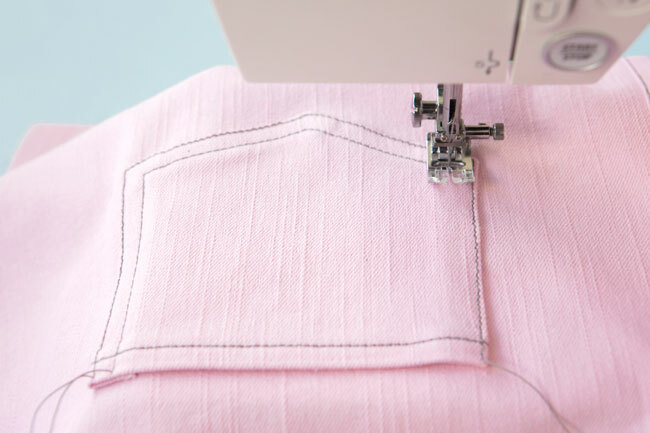 Fold a scrap of fabric three or four layers thick, and wedge it under the back of your presser foot, just behind where you're going to start sewing the pocket. This folded piece of fabric will raise the back of the presser foot level with (or just higher than) the front of the foot, meaning it won't get stuck trying to climb the hill of the thick pocket layers, and therefore won't start sewing loads of knots on the spot. Hooray! Using dedicated topstitch thread? As topstitch thread is thicker than regular thread, it can make clumpy knots when back tacked. 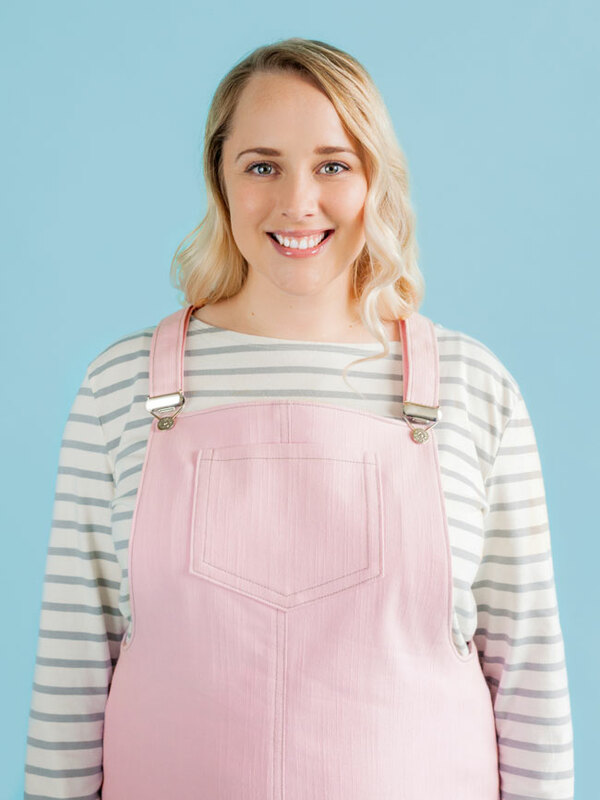 Avoid back tacking when topstitching the front and back bodice seams - the stitching is unlikely to unravel as it will be crossed with another line of stitching later (when it's hemmed and when the facing is attached). You do need to secure the topstitching on the pockets though, as this stitching isn't going to be crossed. Instead of back tacking, leave some loose threads at the start and end of the stitching. Turn the dress to the wrong side, and pull on the bobbin (underside) thread - it should pull a little loop of topstitch thread to the wrong side. Use a pin to pull this topstitch thread to the wrong side of the fabric, then you can tie the two threads in a tight double knot by hand. Alternatively you can use regular thread for topstitching your dress - in which case, don't worry about this step! Once you've sewn the straps right sides together, you need to turn them right sides out before attaching them to the dress. There are various ways to do this - what I usually do is place the stitched short end against the end of a blunt knitting needle, chopstick or similar (definitely something blunt so you don't poke a hole in the strap - yes I've done that before, oops! ), then smooth the strap right side out over it until you can pull the whole thing through to the right side. 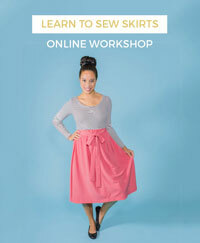 If your fabric is very heavy, you may find this a bit hard to do. If it really doesn't seem to be moving, what you can do is unpick the stitching (or cut new straps if you've got some leftover fabric), and press the straps wrong sides together with the seam allowances pressed inside. Pin the layers in place, then topstitch the straps from the right side to hold everything in place. 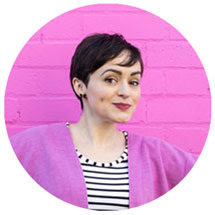 If you've got your no-sew buttons from somewhere else, take a look at the manufacturer's instructions for how to attach them. If the nail part won't go through the fabric on its own, pierce a hole in the fabric first using something sharp, such as a tailor's awl or the end of some sharp embroidery or nail scissors. If the button side won't clip on securely with just your fingers, you can hammer it in place. Place the button face down on top of something like a chopping board or heavy book so you won't damage the table, and position the dress on top of it, with the nail part pierced through from the back of the dress. Give the nail a light whack with the hammer, check it's still in the right place, then hammer it until it feels securely attached to the button. 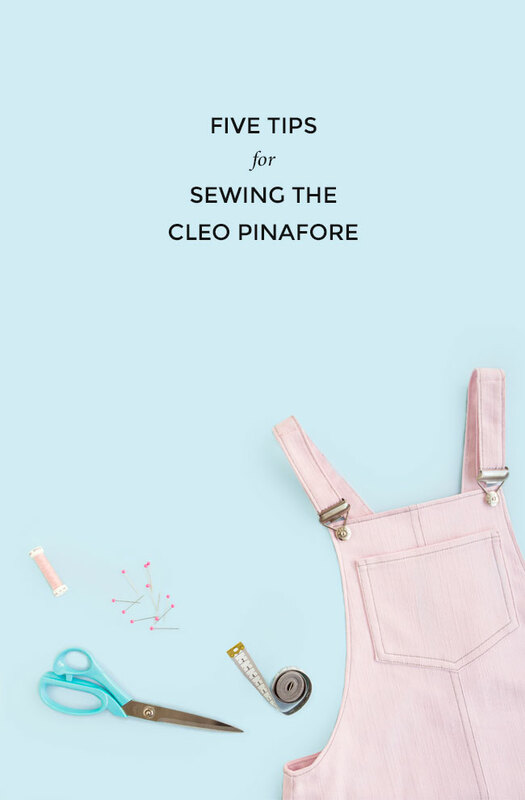 If you're making the pinafore version with buttons and buttonholes, you may want to create a "thread shank" if your fabric is fairly thick. This will create some space underneath the button for the bodice to sit when it's buttoned up, without straining the thread. Start hand sewing the button on with just one loop to start with - before you pull the thread tight, stick a large match stick or similar through the loop between the button and strap. Pull the thread tight - the match stick leaving some extra space under the button - and continue sewing. 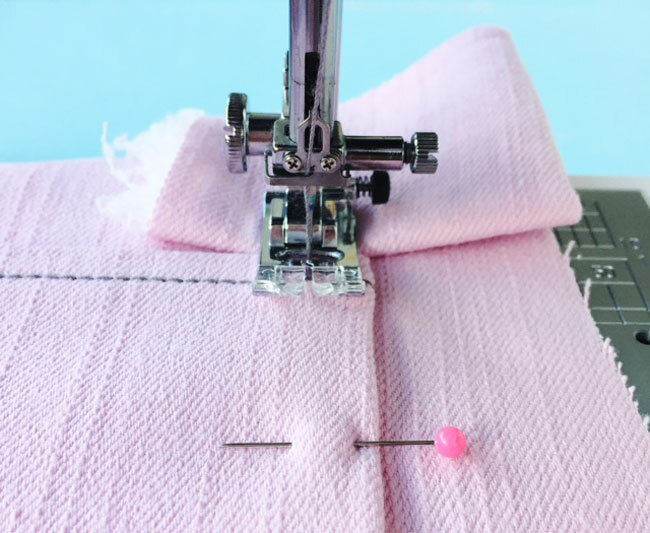 Once you're ready to knot the threads, remove the stick, and wrap the thread around the underside of the button a few times, around the extra thread, to create the thread shank. Knot the threads as normal.